The JDC Archives is pleased to announce a new partnership with the International Tracing Service (ITS), located in Bad Arolsen, Germany. An official letter of agreement was recently signed between JDC and the ITS. This collaboration will enable the JDC Archives to reunite, in a digital environment, important wartime and postwar JDC records concerning efforts to search for missing relatives and to provide emigration assistance, with related materials housed in its New York and Jerusalem repositories. The International Tracing Service began operation on January 1, 1948, as a successor to UNRRA’s Central Tracing Bureau. With the establishment of the ITS, JDC closed down the local Tracing Bureaus in its overseas offices. Likewise, the Central Location Index, a clearinghouse created in New York by JDC and other US-based organizations to coordinate and unify efforts to respond to inquiries from overseas relatives of European Jews, ceased its activities. Records of these family search and location entities were integrated into the ITS files. 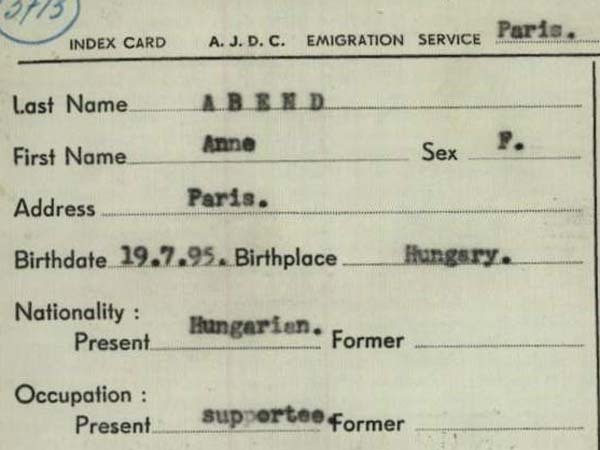 Because of their relevance to tracing efforts, the index cards from JDC’s Emigration Service in Paris, along with hundreds of lists of survivors and refugees and emigration lists from JDC local offices were shared with the ITS as well. 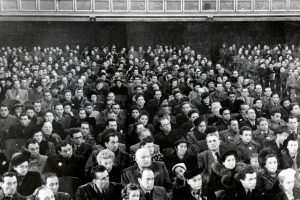 Today, the ITS archive includes more than 30 million documents related to Nazi persecution that concentrate on three topics: incarceration, forced labor, and the liberated survivors. Its collections have been included on UNESCO’s Memory of the World documentary heritage register. Although the ITS has digitized the JDC materials in its collection, they are not available online and are not described at the item level. 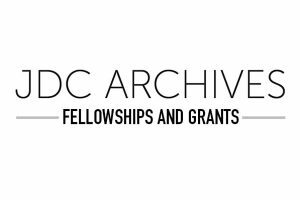 The JDC-ITS collaboration aims to make these JDC records more accessible to genealogical and family researchers and others, including JDC Archives staff. The first group of digital files that has been shared is the set of 30,000 Emigration Service Cards from JDC’s Paris Office. The information on these cards will be indexed and added to the JDC Archives online Names Index. This project has just begun and is estimated to take up to two years. 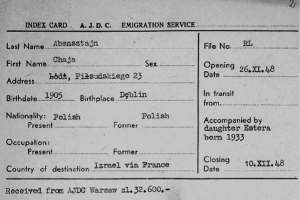 The records will significantly increase the existing index card records in the Names Database, which currently includes more than 100,000 cards from the JDC Emigration offices in Munich, Vienna, and Warsaw and refugee case cards from Barcelona. 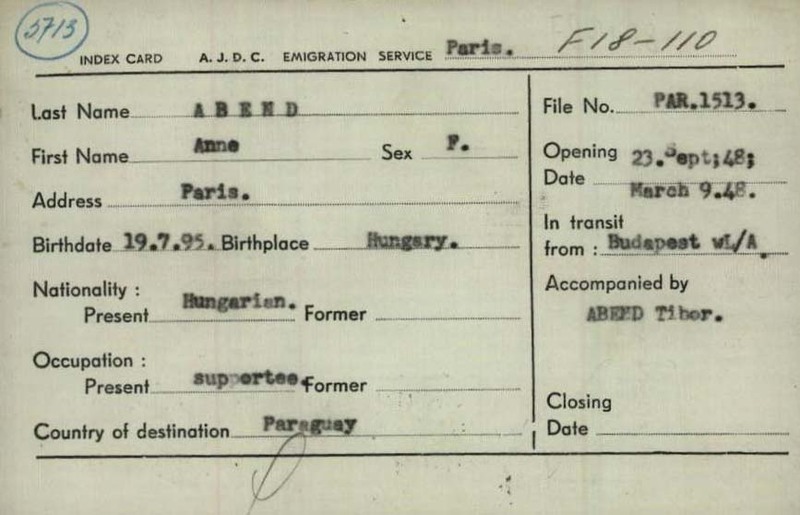 (Above) JDC Paris Emigration Service index cards for Anne and Tibor Abend received from the ITS, with (below) an extract from an JDC Emigration departure list showing the next phase of their journey. An example of the way in which the digital co-location of the JDC records from ITS with other JDC collections enriches our knowledge emerged almost as soon as the indexing of the Paris Emigration Service cards began just a few weeks ago. 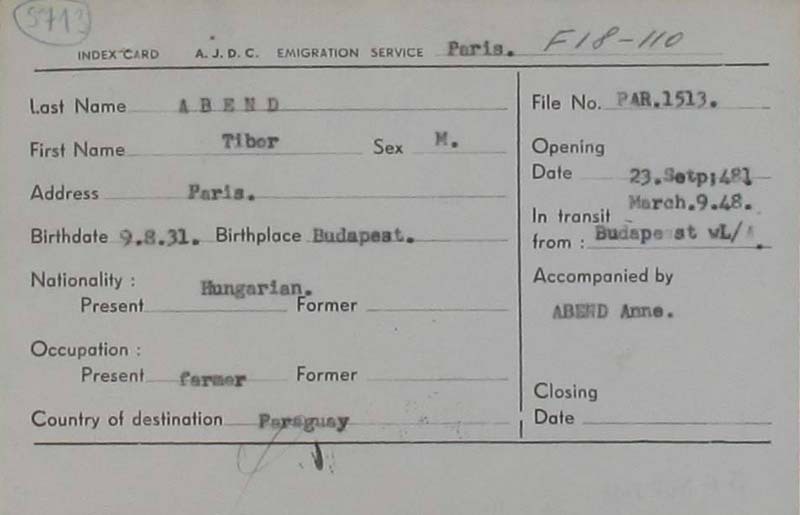 A pair of cards for Anne and Tibor Abend, showing them arriving in France in transit from Budapest in 1948 and bound for Paraguay, now joins a previously indexed JDC Emigration Headquarters departure list, which shows Anna and Tibor leaving Paris on June 12, 1949, on a train to Genoa, where they would embark for Paraguay. In this way, the details of stories of those assisted by JDC will be augmented and clarified. Inclusion of the JDC Emigration Service cards from Paris in the JDC Archives Names Index is the first project in this JDC-ITS collaboration. As the records are created, they will be uploaded to the JDC Names Index in batches to make them available for public search. Further projects are in the planning stages. For further information about the JDC Archives Names Index, click here. See especially the complete set of Lists in the Names Index.